Tri-Art Nepheline Gels are semi-transparent mediums used to create flexible, granular textures. They mix easily with Tri-Art Acrylic colors and mediums, or those of other manufacturers, to create a variety of effects. Tri-Art's Finest Liquid Acrylics are especially effective as tinting agents. Nepheline Gels boast the same flexibility and adhesive qualities as all other Tri-Art Gels, and they can provide an interesting surface for pastel work and mixed media applications. Tri-Art mediums have been formulated to provide artists with an endless range of textures, effects, and finishes. 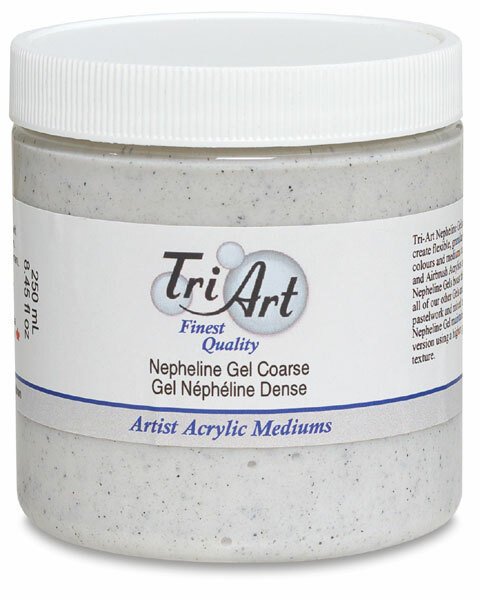 Tri-Art Gel Mediums are viscous and can maintain dramatic and detailed texture, while Tri-Art Self-Leveling Gels are honey-like in consistency and smooth out to form thick pools or flowing strands of acrylic. 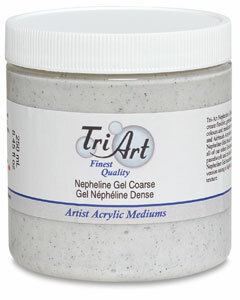 Tri-Art Nepheline Gels combine gel medium with nepheline syenite and provide a gritty, granular texture. They are flexible and tint-able with acrylic color.